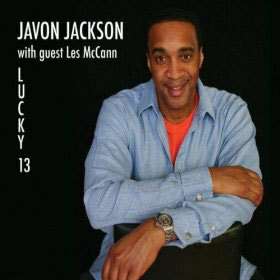 Javon Jackson’s simultaneously brawny and brainy tenor sound, burly and commanding but also capable of surgical precision, is well featured on Lucky 13, not coincidentally his 13th album as a leader. Having graduated from the schools of Art Blakey, Elvin Jones and Betty Carter before embarking on his solo career, Jackson knows a thing or two about pacing and programming, and he applies those skills to this appealing set of familiar tunes and original compositions. Les McCann, a Jackson tour mate for the last five years, lends soul-jazz authenticity on piano and growly vocals, revisiting his 1969 crossover hit “Compared to What” with a rambunctious version recorded live at the Kennedy Center in 2008; Jackson’s soloing is as ferocious as the passion behind McCann’s singing. McCann is also showcased on a molasses-slow seven-minute version of the love ballad “With These Hands” and a similarly relaxed “Amazing Grace.” On both tracks he’s accompanied solely by Jackson, a natural duo partner whose playing is nicely attuned to McCann’s. Jackson, joined elsewhere by pianist Joel Holmes, bassist Corcoran Holt and drummer McClenty Hunter, opens strong with an exuberant take on Stevie Wonder’s “Don’t You Worry ‘Bout a Thing” before offering three of his own pieces. 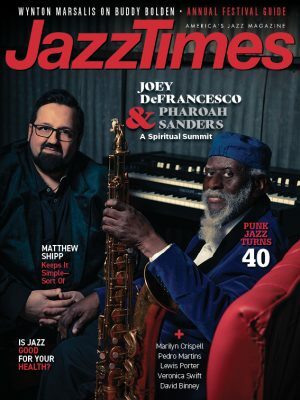 Beautifully turned ballad “Lelia,” a duo with Holmes, is followed by the gently waltzing “TJ,” which opens for extended solos by the pianist and Holt, and the driving Trane/Pharoah-style blues of “Mr. Sanders,” sparked by the bassist’s unaccompanied sliding and chording. The drummer gets some with “Sun Up,” bubbling up under the tenor on a tune from Jackson’s score for the early Hitchcock silent film The Lodger, inspired by the search for Jack the Ripper. The waltz-time piece, belying the movie’s subject matter, is buoyant and insistently sunny.